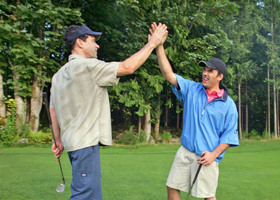 Beauty and quality come together when you choose The Okanagan Golf Club for your meeting, party or gala event. Our commitment to providing the best in service and amenities is matched only by the beauty of our location: 384 acres of landscaped greenery edged with Ponderosa Pines, all in the heart of the gorgeous Okanagan Valley. Delight your guests with a customized menu showcasing the freshest Okanagan produce and local wines; amaze them with our excellent service and warm, inviting ambiance. Offering a range of spaces to accommodate small gatherings or groups as large as 250 in comfort and elegance, everyone is welcome at The Okanagan Golf Club in Kelowna.